there’s something appealing about beginning with quitting. 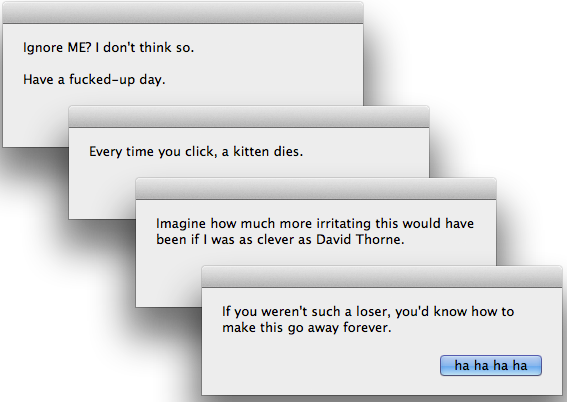 this little app was inspired a couple of years ago by a story about a freelance designer who created a fake error message to communicate his disgruntlement. you can find one version of the story here. the original artwork is attributed to Juan Carlos Pagan. wouldn’t it be kinda cool to have an actual working version to really give it to ’em? iQuit.app — a dialog box with expletive-ridden abuse made with love and care for your favourite employer/manager (it’s up to you how you deploy it). warning: do not click the ‘ignore’ button unless you know how to force-quit an application. it will send you into an eternal loop of abuse. disclaimer: MacGrunt takes absolutely no responsibility for any consequences arising from the use of this app. it’s a simple applescript which will do no harm to your computer, but may well do harm to your career. update : 17 July : iQuit updated to show a ‘clean’ warning icon. congratulations to you if you downloaded the original, limited-edition, branded version. update2 : 19 July : Juan Carlos Pagan leaves positive feedback on the iQuit application version of his original artwork. read his comments below.